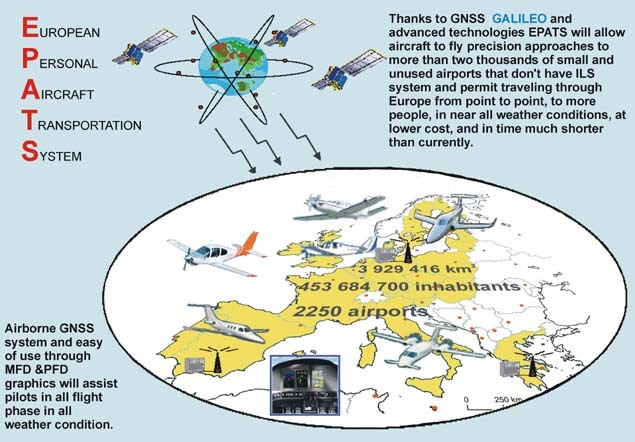 The EPATS (European Personal Air Transportation System) focuses on the future Highly Customer Oriented and Time, and Cost Efficient Air Transport System. It fills niche between Surface and Scheduled Air Transport. Future mobility cannot be satisfied only through investments in hub and spoke, or rail - and highway systems. This future EPATS system will provide a wide choice of transportation mode - and the wider use of small aircraft, served by small airports, to create access to more communities in less time. The goal of the EPATS proposal is to demonstrate the needs and potential of small aircraft business development and to propose recommendations for the introduction of this new European Air Transportation System in the context of the European Research Areas. - The potential new market for personal aviation up to 2020. - The potential impact of this new way of transport on the European ATM, and airport infrastructures, as well as the environmental, safety and security issues involved. The studies will be carried out by a Consortium supported by representative experts of the EPATS stakeholder community. The deliverables of these studies will be rapports containing a joint vision of the personal air transportation system in Europe to 2020 and proposals for developing this new small aircraft business at a European level. The EPATS SSA proposal fits in the framework of FP6-2002-Aero-2 “Thematic call in the area of Aeronautics Specific Support Actions”, especially: “Developing an EU research strategy in the sector” and “Promoting SME participation”. A full package with information (for researchers, the press, and anybody who may be interested in the future of air transport) is available upon request. Please contact us to get this package (whereabouts are available at the bottom of this page).